Have you heard the buzz about energy-efficient cooling for your home? 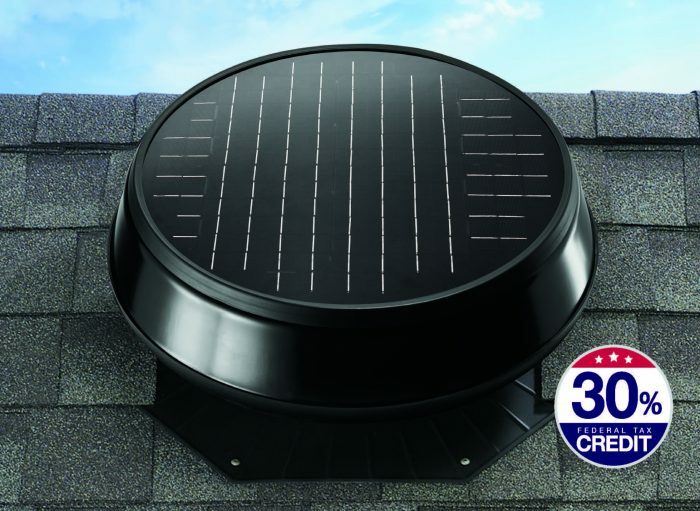 Our Solar Star (a fancy name for Solar Attic Fan) combines optimal power and performance to efficiently vent hot air and moisture from your attic. When your attic stays cool and dry, it gives you greater comfort in your home. Still wondering why this is a must-have for your home? Let’s breakdown the benefits associated with this cool, money-saving ventilation solution. As the Solar Star cools and dries home interiors, it aids in helping prevent the growth of mold and mildew. In return, you prolong the life of your roof and reduce damage to your attic space. Since this attic fan is powered by the sun, there are no operational costs. Better yet, the Solar Star qualifies for a 30% federal tax credit. Need we say more? The perks and savings are building. With a Solatube Home Solar Star, you use fans and air-conditioning units less. This translates into lower electricity bills. In addition, since your air conditioner is working less, it’s living longer. Even with the most powerful solar attic fan around, it’s whisper quiet. Whether you’re outside or inside your home, this ventilation system keeps the calm while reducing harmful heat inside your attic space. Get a 30% federal tax credit back on product and installation costs. It’s unobtrusive and leak-proof! With a sleek, low profile and seamless one-piece flashing that’s tailored to the contours of your roof, you have a guaranteed leak-free and durable product. From start to finish, the process of installing your solar attic fan is easy and straightforward. Our certified Solatube Home installation consultant can have the product up and running within an hour. Lastly, the Solar Star automatically turns off when the temperature in your roof cavity drop below 18°C and then restarts when the temperature is over 29°C. No need to remember to turn it on or off. Still not convinced? Visit our Solar Attic Fan page here to learn much more about this innovative ventilation system and how it all works. Now is the time to be proactive in lowering energy cost and doing what’s best for the longevity of your home. Click here to book a free in-home consultation with one of our expert installation consultants or call to speak to our customer service team. We’re currently serving San Diego and South Orange County at (619) 319-9426 and Los Angeles and North Orange County at (323) 886-2271. For a free 24-hour price quote, click here.